Punt gunners are like underwear – the only time most people notice them is when something goes wrong. But strong play from gunners can help punters pin teams in their own territory, winning the field position battle on special teams. Matthew Slater has been a punt gunner for the New England Patriots since his first year in the NFL. 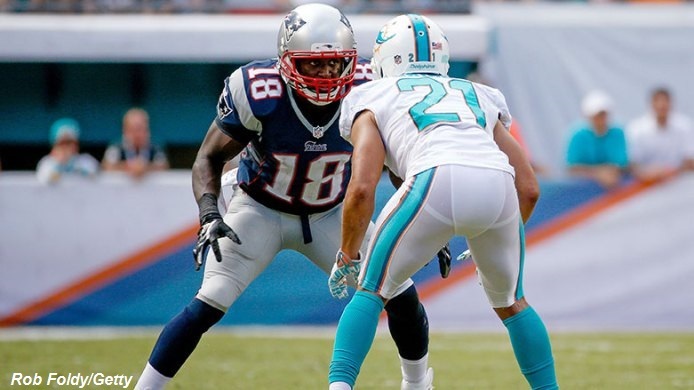 Entering his eighth season, Slater describes his job as “a street fight” where a combination of physicality and smarts is needed to win the battle and complete the task at hand – minimizing the return yardage of some of the fastest, shiftiest players in the NFL. 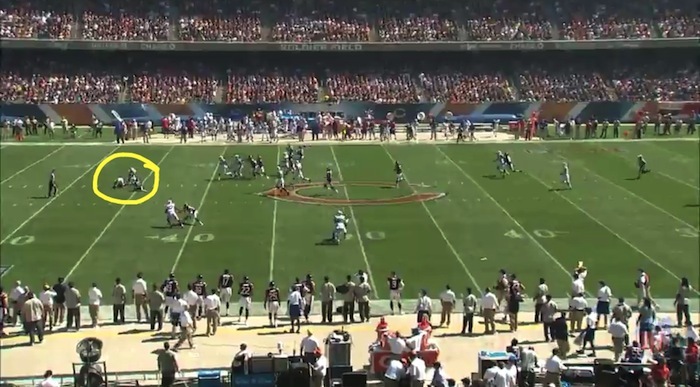 While special teams are typically thought of as commercial break extensions for a number of fans, good coverage on a punt is critical to a team’s victory in the field position game. Let’s take a look at some of the necessities for a successful punt gunner. Pro Football Focus rated Slater and Marcus Easley of the Buffalo Bills as its top two gunners in 2014. One area in which both players excel is in getting a clean release off the line, often in the direction the kick is expected to travel. To be an elite gunner, it is not enough to simply take what is available to you – you must press the issue to create the shortest path between yourself and the returner. 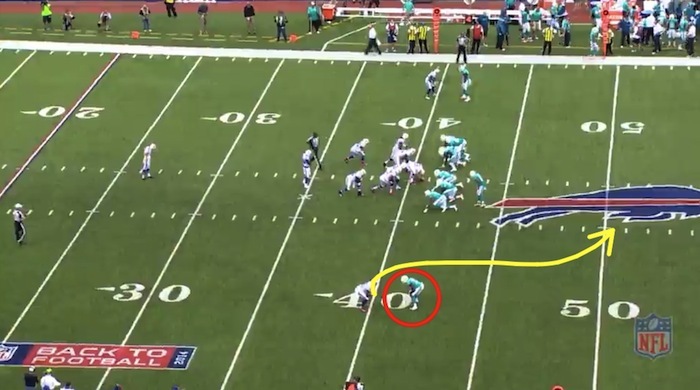 Easley provides a great example of this in his Week 2 tilt against the Miami Dolphins: Easley lines up at the bottom of the screen with a single Dolphin blocking him. Gunners typically face single coverage, though teams will occasionally double-team gunners in the event of a directional return. In recent years, NFL punt units have taken advantage of the improved directional kicking abilities of punters, using these skills to pin an opponent on the sideline. This dramatically reduces the number of options a returner has available. With these directional kicks being called before the ball is snapped, gunners and the punt team are aware of where the kick is going and where they need to end up. 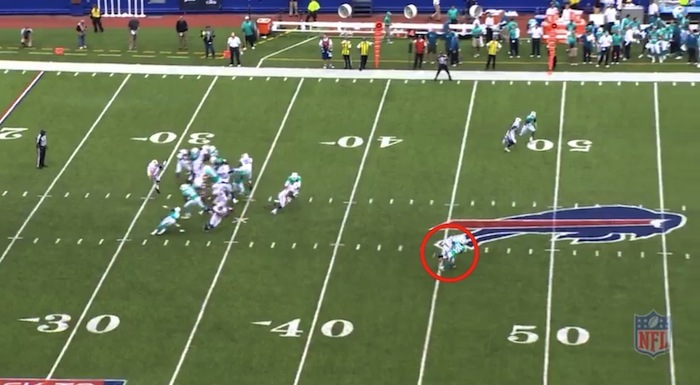 Easley knows the goal of this punt is a kick towards the left sideline, making an inside release preferable to him, as this shortens the distance he must travel to make a tackle. However, notice the feet of the Dolphin blocker in front of him. While Easley’s right foot is just outside the numbers, his blocker is aligned directly over the numbers, meaning Easley has to utilize a quick burst off the line to gain inside leverage and win the battle early. Easley doesn’t mess around, taking a quick first step to the inside and driving for the center of the field: His blocker stays with him for the first two steps, mirroring his move to the inside. 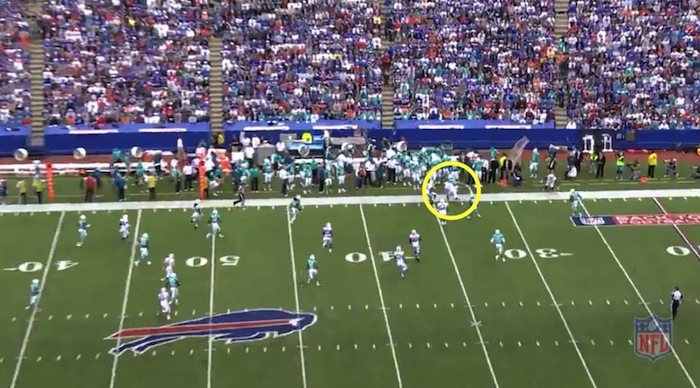 Easley throws his right arm into the chest of the blocker, straining for leverage as he fights for position. 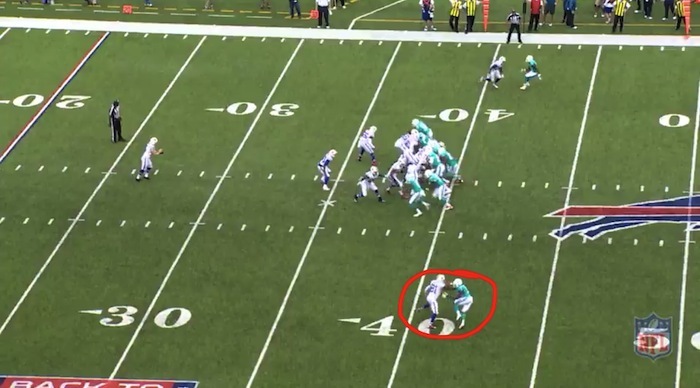 Easley finally gets inside position, with the Miami blocker draped on his back five yards downfield: This proves critical to the outcome of the play, as Easley is able to turn this positioning into a successful tackle downfield, limiting the Dolphin return: Although Easley had to fight for the release, his initial burst and strength off the line allowed him to get to the spot he wanted on the field, putting himself exactly where he needed to be. While this is a great example of an inside release, gunners can also use outside releases in the event the kick is heading to their side of the field. The direction may be different, but the principles and concepts behind the move are the same. 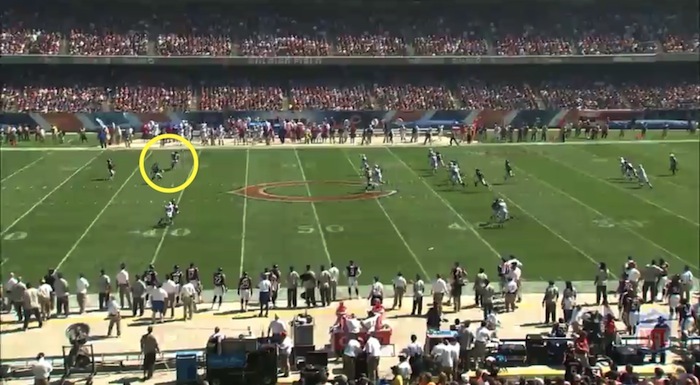 But as we saw with Easley, the path downfield is often not a straight line. Blockers are often clutching and grabbing at a gunner’s jersey, attempting to throw him to the ground as they head downfield. It is not enough to be fast; one also has to be strong enough to weather any blows from a blocker and continue with speed. 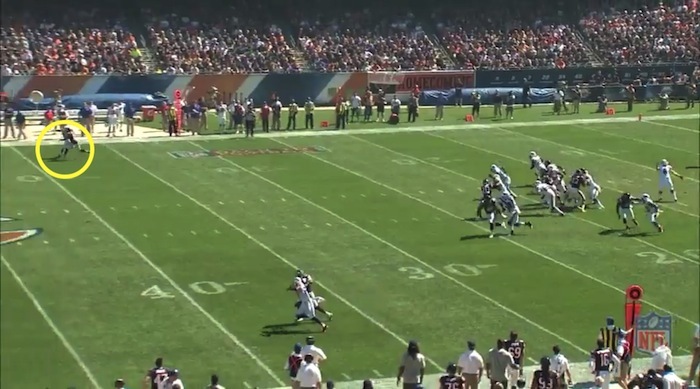 In their Week 1 matchup against the Chicago Bears, Easley set up at the top of the punt formation with a single blocker in front of him: At the snap, he takes an outside release and heads downfield. 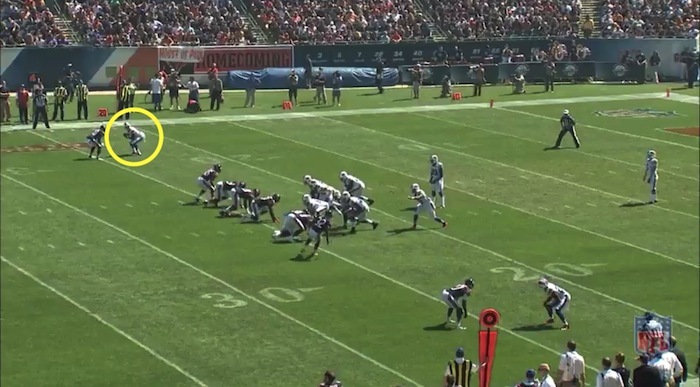 Unfortunately, the Bears blocker stays right on his hip, walling him off to the outside, throwing an arm across his chest to slow his progress: Easley is not impressed. He fights through the block while maintaining his speed, closing towards the center of the field as he battles: Easley’s hard work pays off, as he runs the Chicago blocker straight into the returner, taking out both men in the process: It is not a glamorous play, nor is it flashy, but Easley’s grit and determination is the key reason for his success here. This is the “street fight” that Slater described, as a gunner needs to do anything in his power to fight his man for the length of the field and still complete the task at hand. To be elite, one cannot dodge an extremely athletic blocker off the line, run as fast as possible for fifty yards, and battle that same blocker for the length of the field, only to be out of position at the end and unable to make a play. No, to be elite, that gunner must also make the play at the end, especially the plays that seem impossible to make. 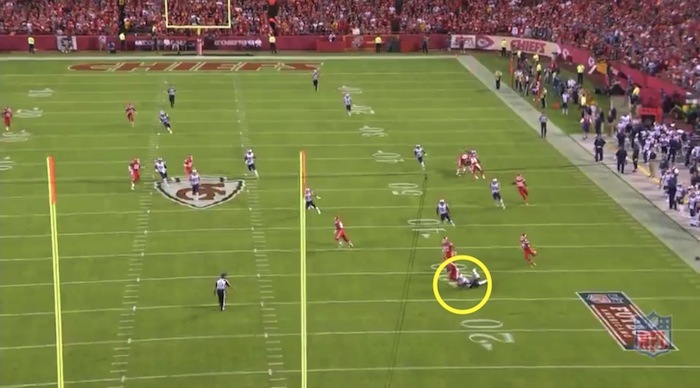 Slater provided one of the best examples of this in an otherwise miserable game for Patriots fans against the Kansas City Chiefs in Week 4 last season. Slater is double-teamed. But what does he do? Just runs around the first blocker, and then sprints past the second one, ending up five yards clear of both by the time he is nearly at the returner. Then what? Only a shoestring tackle on a 59-yard punt from a nearly impossible angle coming from the sideline: This is arguably the most critical aspect of punt coverage. A gunner can do everything right for the first 95% of the play, but if he takes the wrong angle at the end, all of his hard work is undone. Being a great gunner requires outstanding spatial awareness, allowing the player to calculate angles on the fly and adjust his trajectory at high speed while attempting to hit a small, shifty target. If unable to make the tackle, a gunner must force the play in the direction of his coverage unit to maximize the chances of a short return. All this has to be factored in while running at full speed and being mauled by blockers dead-set on preventing the gunner from completing his task. Punt gunner is not a position on which most teams spend a lot of money. Yet it can be the difference in field position during a tight game. The ability to pin an opponent deep in their territory is not simply a reflection of the punter, but of the coverage unit that starts with these players. They are critical pieces to building a team, and should not be overlooked in the process.